Here we have the famous saying “Buying real estate is not only the best way, the quickest way, the safest way, but the only way to become wealthy”. We are a nation with a rapidly rising population. However our landmass remains constant .How do we provide for the residences and shelter for so large a number of people. The answer is real estate development and urban planning.”Landlords Grow Rich In Their Sleep”. We all know what this means. Here we need to follow a very clever approach .Buy land on the fringe of a developing city and wait .Buy land when other people want to sell. Buy and hold land. Isn’t It A Comfortable Feeling Standing On Your Own Ground? .This One Thing Won’t Fly Away”. There are very few things in life which can give the peace of mind that possession of land gives. I would like to remind all of you that the team of Financial Planners at IndianMoney.com are always there for you to plan your Real Estate needs in a most effective and efficient manner. You can explore this unique Free Advisory Service just by giving a missed call on 02261816111. India’s real estate prices rose rapidly during the period of 2002-2007.This was categorized by a fall in the home loan rates, rapid development of infrastructure and supporting roads, bridges and rapid urban planning lead to the development of software parks in Bangalore and Hyderabad which lead to development of real estate and rapidly rising prices. Here the cities of Delhi and National Capital Region hold the highest potential for growth and development in the country. Here you would have noticed a number of real estate projects taking off in Noida and Faridabad. Here these projects focus on affordability. Small Is Big….Here a large number of affordable 1 BHK projects are being launched and rapidly lapped up in these regions. In a single year from 2010-2011 we noticed over 30% increase in prices in the NCR-Delhi regions. Can You Tell Me Any Other Class Of Assets That Can Appreciate So Much? The NCR region with its rapid pace of development and job opportunities is tapping affordable housing. A certain developer launched 1 Lakh affordable houses in the National Capital Region. Clearly Small Is Here To Stay. Yes I mean the great city of Mumbai. This in the last 10 years has become a city of the rich .Affordability within the city limits is out of question for most of the population. Yes Mumbai has become a city of the rich. Here an investment in Lakhs has become an investment in Crores. Clearly nothing can beat such a rise in appreciation Here a flat in the Mumbai Metropolitan Region which was costing about 30 Lakhs goes for about 1 Crore. Mumbai is clearly a city of the rich. Here foreign inflows have made realty unaffordable for locals .Post 2006 most of the houses have been lapped up by HNI’s and NRI’s. Here in a single year we noticed an appreciation in residential housing prices in certain areas at an whooping 40% Year on Year increase. Here the developers state that high land prices and development costs are to blame for such a wild price increase. Here the developers are hand in glove with the politicians. We may have read about the Adarsh Housing Society scam. Here the developers launch highly priced projects blessed with extra FSI from the politicians which has lead the city to accept as a foregone conclusion such highly priced land. Here the greed for high profits has led developers to turn a blind eye towards affordable housing. Until the developer gets his price he will not sell. This has led to large piling up of unsold inventory. Mumbai is a city of investments and clearly real estate is its prime investment. People from states such as Gujarat purchase flats and lock them up. They sell them years later at a phenomenal profit. Navi Mumbai was a city planned and developed with an idea to de congest Mumbai and raise a city built on affordable housing. This was an incentive to attract working professionals to the city by providing affordable housing. Here areas like Vashi, Belapur, Kharghar, and Airoli have seen prices appreciate almost 5 fold in the last 5 years.In areas such as Vashi apartments are selling for over a crore for 2 BHK apartments. This is because businessmen and NRI’s purchase and lock up these flats and sell them at a profit. Here just like in any other city the prices in the outskirts of Bangalore have risen more rapidly than the central business districts which is basically an inner city. Here the outskirts include Sarjapur , Hoskote and Devanahalli areas including the airport areas. Here in the early 1990’s Koramangala was considered to be on the outskirts of the city. The price of land then was 300 per sq ft. Koramangala in the year 2000 became a CBD and its price increased close to 2000 per sq ft. Currently its rate is close to 12000 per sq ft. Isn’t this an unimaginably high appreciation. Here we have the HSR Layout who’s price hovered around 600 per sq ft in 2000.These were the outskirt areas. Now the price in 2012 for land at the HSR Layout is around 8000 per sq ft. Here we have Sarjapur where the land prices hovered from 300 per sq ft about a decade ago to around 2500 per sq ft last year. Quite an appreciation..
Clearly we need to concentrate on the outskirts. Clearly areas such as HSR Layout, Sarjapur and Devanahalli need to be watched. If we invest in land and flats in the outskirt areas in Bangalore we have a chance to earn a high Return on Investments. Here a proposed metro rail will connect Noida with New Delhi. This improves connectivity with Noida Extension.In the NCR the Noida Extension provides for affordable housing with a chance of property appreciation of about 20% in the next 5 years. About 40 Kms from South East Delhi we have Greater Noida. Excellent connectivity is present between Noida and Greater Noida. The Yamuna expressway connects it to Agra. A metro will connect it to Delhi. This is the upcoming educational and industrial region and one can expect a property appreciation of around 25% in a year. The area of Chembur in Mumbai is poised for rapid development owing to its proximity to Bandra Kurla Complex a huge business area with lot of top Companies shifting base from Nariman Point owing to cheaper leasing and Commercial Real Estate prices in this area. The Santacruz-Chembur link road and Wadala-Chembur monorail improve connectivity. The same benefits would help Wadala as well. The Bangalore airport and its tag as an IT hub benefit Hebbal and areas close to it. New monorail and Namma Metro will boost its connectivity It has good infrastructure to support residential growth. K R Puram’s proximity to Whitefield will improve its value. It is 3 Kms away from the metro station and the widening of the Old Madras Road and Peripherical ring road will improve connectivity. Here in the year 2000 we had the price of gold coins basically of 10 g at about INR 4500.This was followed by a price increase of INR 7000 in the year 2005.Here the gold coins value was between INR 10000 to INR 12000 in the year 2007-2008.The value hit an all time high of around 32000 per 10 g in 2012 and currently hovers around 28000 per 10 g in the year 2013. Here if you had invested 1 Lakh in gold in 2008 it would have a value of over 2 Lakhs in the year 2011.This is more than double or an increase of 100% in value in 3 years. Clearly a phenomenal rise in appreciation. Here India saw a staggering appreciation of 111% in a 3 year time frame mainly because of the falling rupee value. Over a period from the year 2011-2012 gold gave a return of over 30 % the only asset class which gave such returns when compared to equities after adjusting for inflation. However gold gave a return of around 7.5% in the year 2012. Currently gold prices are on a downward spiral with gold hitting an 18 month low in the month of April 2013.This means that gold currently is giving negative returns when we compare with the last year. Real Estate has capital appreciation in the long run along with a sense of ownership. We have all heard the saying “There’s No Place Like Home”. Gold is a good investment but Real estate is the real investment. Gold requires storage charges if it is not in the form of an ETF but we can always buy a second home lock it up and sell it once its price appreciates. 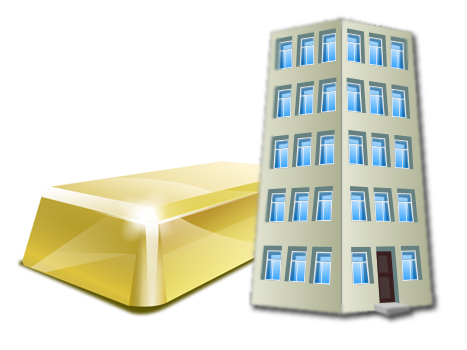 Gold has given stupendous returns mainly in the period of 2008-2011.However real estate in the metro’s such as NCR, Mumbai and Delhi have also risen at meteoric levels. Besides one can always earn steady rental amounts. I would like to end this article with the conclusion that both gold and real estate have their uses albeit in different conditions.” Gold Is A Hedge Against Inflation”. Real Estate in Metro’s provides higher returns with the present trend being sachet marketing where the land prices remain same but the size of the house decreases. With vast unsold inventory particularly in Mumbai this sachet marketing technique can prove to be a big hit. Here we have a saying “Grass Is Always Greener On The Other Side”. Here it is too close to call between gold and real estate and one should invest depending on one’s needs. You can always look up the website IndianMoney.com for your Real Estate queries and questions.